This week I share transcriptions of several letters my great aunt, Minnie Van Every, sent to the Houston Post's children's section when she was 13 and 14. These letters indicate either the quality of the local public schools, or the intelligence of my great aunt. (She would become a teacher.) They also may help to solve a genealogical mystery. Minnie was born in July of 1884. So she is only a few months older than 13 with the first letter. 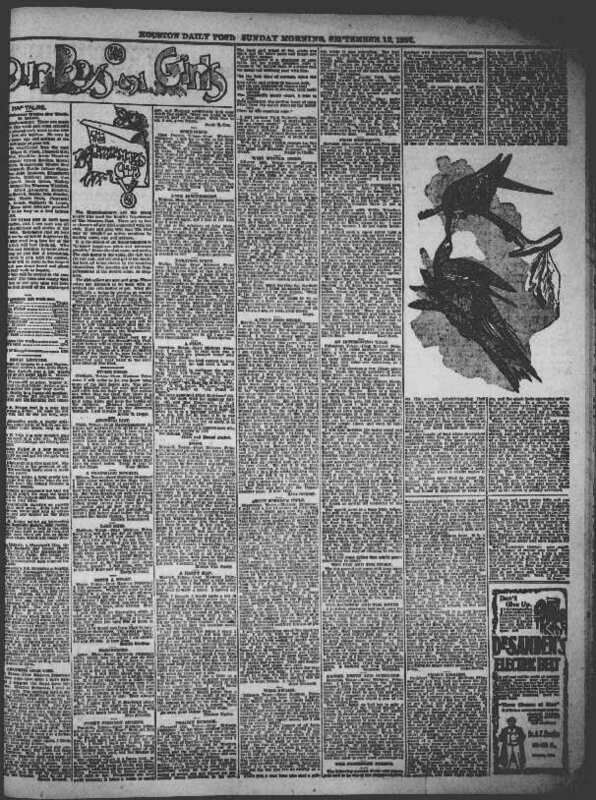 The image below is of the entire page of letters from the September 12, 1897 issue. Dear Mistress Primrose: Enclosed please find my list of birds. I will now write about a bird called dodo. This singular bird, which was supposed to be extinct, was discovered in the Mauritius islands by the earlier voyagers. For many years their accounts of the dodo were supposed to be mere flight of fancy. Lately, however, the discovery of several relics of this bird in various countries has set the question of this bird’s existence at rest, but not the question of the proper position of the bird. Some think it belongs to the pigeons and some to the ostriches. In the Museum of Oxford are the head and foot of the dodo, sole remnants of a perfect specimen known to have existed in 1700, and in the same place, in the year 1847, during the meeting of the British association, were gathered together the whole of the existing remains from every country. 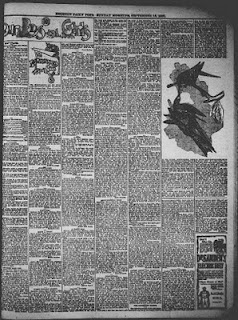 Its body was round and fat, which occasioned the slow pace and there were very few that weighed less than 30 pounds. It has such large wings it can not fly. It is still in the range of possibility that this bird may again be discovered, as at present little of Madagascar has been searched, and in that island, if anywhere, it will be found. Dear Haphammer: After an absence of some time I will come again for awhile. [for excerpt see my Blog Action Day post]. Ganado, Texas – Dear Haphammer: I will tell the Haps how firecrackers are made. The manufacture of them is a very simple matter, but because it requires the handling of that dangerous element, gunpowder, it is only carried on in the regular licensed establishments for the manufacture of fireworks. Firecrackers are made of soft pasteboard impregnated with some combustible or explosive material. These strips are doubled over many times and rolled closely around a small piece of composition: that is, powder mixed with sulphur and other things that will burn readily with a hissing sound. Usually a little bursting powder is put in before the composition, so that the burning of the cracker is finished with an explosion. A cord is attached to one end that has been soaked in a solution of saltpeter or similar substance, so that it will burn readily. I close with love to all. A true Hap. Dear Haphammer – After much study and deliberation I have at last come to the conclusion that Stephen F Austin was the man who did most for Texas. He was the man who first stirred up the patriotism in the hearts of his fellow countrymen. From his father’s death to his own he devoted his entire time and risked his life several times for Texas. He cared little for himself, for his last day was spent for his country. He had an unblemished character, was loved by all, and often termed “the father of Texas.” In his colony he had almost unlimited power, but ruled mildly, never marrying, he devoted his time to the welfare of the colonists and was even loved by the children. On December 27, 1836, he died. His loss was not only mourned by the people of Texas, but by all lovers of liberty. Julia Robertson, I was quite surprised to see a letter from you. I thought you had forgotten the Haps. Bessie Chapman, my uncle’s name that I spoke of in my last letter was S.W. Denyer. 1) It's clear the HappyHammers page was a form of 'social networking' for Texas children. It's clear from the places mentioned in the letters that the readership of the Houston Post spread at least throughout most of Southern Texas. My great aunt, Minnie, didn't know Mabel, Julia, or Bessie, but they chatted with each other through the letters. 2) I found these letters at Chronicling America, but not every issue of the Houston Post from those years is online there. So I have been unable to find the initial letter Minnie wrote that mentioned her uncle. 3) If it weren't for these letters I wouldn't know that in November of 1897 the Van Every family left Maxwell, Texas (in Caldwell County) for Ganado (in Jackson County) and returned to Maxwell before May of 1899. The two towns are over 100 miles apart. According to testimony given to the Dawes Commission, Minnie's grandmother, Sarah Hartley Denyer Foster died in 1898, and she was living with the Van Everys. When I first read the testimony, I deduced that she had died in Caldwell County. Not having any reason to suspect that my great grandfather had moved his family away from Caldwell County for a year, I made the assumption that she had come to live with her daughter's family, as opposed to the other way around. Since her exact date of death is unknown, and it is equally unknown when the Van Everys returned to Maxwell, I can't be certain which county she died in. However, the odds favor Jackson County. I hope for more copies of the Houston Post to come online so I can see what she might have revealed in other letters.